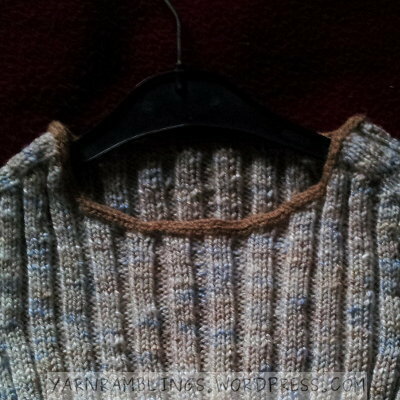 And my biggest satisfaction is that the ribbing is neat — there are no ladders! After trying out many, many tricks and tips to prevent ladders, I’ve finally realized that for me, what works is simply keeping the knit-to-purl transition super-duper-ultra tight. After consciously remembering to do that for a few rows, it just became second nature. 3×3 ribbing for the body, which I inverted (that is, knits become purls and vice versa) near the ribs and then re-inverted near the waist. I added some shaping at the back using short rows, and at the waist using decreases. I’d bought enough yarn for a sweater, so I still have quite a bit of it left. I’m sure I’ll incorporate it in a good pattern! 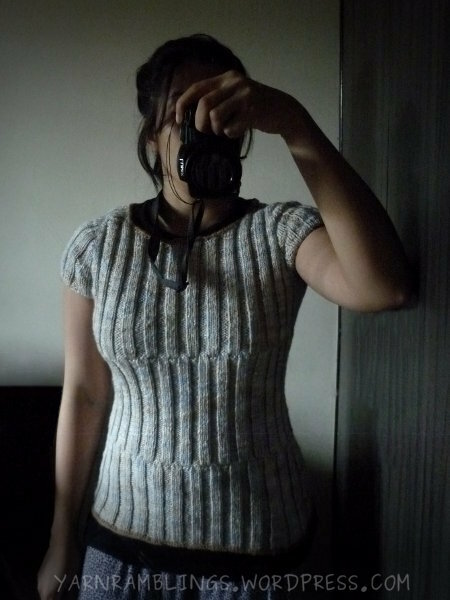 This entry was posted in Completed, Knitting, Tops and tagged Handmade, I-cord, Ladders, Ribbing, Saddle-shoulder, Shaping, Tips. Bookmark the permalink.